This past winter has been brutal for many parts of the northern hemisphere. Somehow, great numbers of local wildlife managed to survive by the look of things. And two mated bald eagles in Pennsylvania are no exception. A live webcam in Codorus State Park near the town of Hanover showed an amazing sight on March fifth. 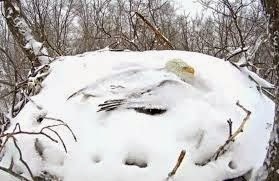 The pair of eagles, named Liberty and Freedom, found themselves buried in snow as they tried to keep their two eggs warm. Their dedication and astute action astonished me. Besides being the national bird of the United States, they are also one of the first raptors to breed each year. Hence their difficulties when a late winter storm blew in. I find myself checking daily to see this family and have been privy to some really stunning natural moments. Watching the pair trade off on egg sitting duty when the male brought her a fresh meal must be a favorite. Well, that is until the first egg hatched around March 24th. 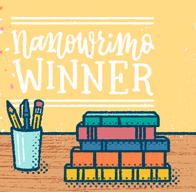 I love the title of your blog Darla - Awakening Dreams & Conquering Nightmares with a Pen - and this post. I look forward to having some time to check out how Liberty & Freedom are doing, thanks for the link. And thank you for commenting on mine! Thank you so much! You're very kind. I hope you enjoy seeing the eagles. Wow. What courageous birds. How tough it must be to be snowed under! Thank you for sharing, Darla. And double thanks for stopping by my blog! Happy A-Z-ing! My pleasure, on both counts! Best wishes to you. Wow! It took me a minute to realize that was an eagle head sticking out of the snow. o.O... :) What a great post. Makes me appreciate nature all the more. Isn't it something? Thank you for commenting. I looked at your live cam on eagles. Absolutely beautiful. Awesome! I'm glad you enjoyed it. They are so majestic. Best wishes, my dear.